Increasing the affordable gap housing stock in the inner city of Cape Town allows young people live centrally. 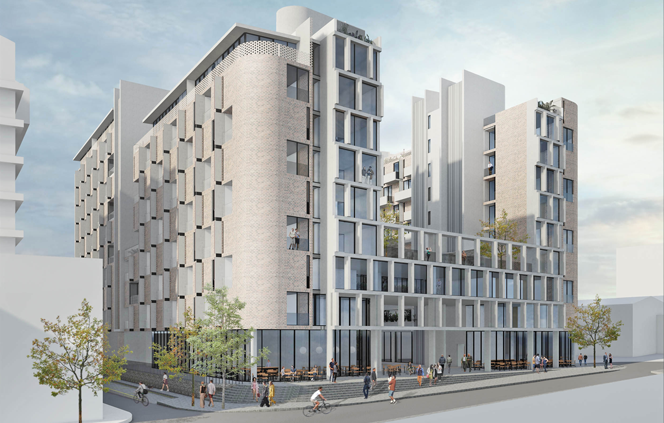 We designed this multi-storey mixed use housing scheme to accommodate 440 residential units, shops, restaurants, offices, and three levels of basement parking. Set to become a new node in the Salt River area, the development is characterised by a large North facing planted atrium which opens an internal shopping arcade. The ground floor brings active edges to all four sides of the building, enhancing amenities and security for local residents. Communal roof gardens occupy the terraced roof scape allowing residents to enjoy the high level views and greenery whilst socialising. Living units range from 25 m2 to 35m2, each with its own kitchen, bathroom and balcony. Project Team: Kevin Fellingham, Bettina Woodward, Nikki Onderstall, Alex Becker, Shannon Tribe, Ilaena Napier & Katrina van Hasselt.